Last year I greatly admired Martyn Brabbins’ recording of A London Symphony, using the 1920 version of the score (review). I was delighted, therefore, when a review copy of this new disc came through my letterbox. Before dealing with the main work, though, let’s consider the “filler”. In many ways, the choral/orchestral work Toward the Unknown Region acted as a “dry run” for A Sea Symphony. In it, VW set some lines from Walt Whitman’s Whispers of Heavenly Death, from the collection Leaves of Grass (‘Darest thou now, O soul, / Walk out with me toward the unknown region…’) I’ve sung in several performances of Toward the Unknown Region, which I think is a fine work, but I had absolutely no idea that VW had made a second setting of the same words. This happened in 1925, a year in which he made three other Whitman settings. The setting is for unison voices with piano accompaniment. The piece also exists in a version in which the piano part was arranged for strings by an unknown hand, known only as ‘W.H.’ We read in Robert Matthew-Walker’s thorough notes that Stephen Connock, Vice-President of the Ralph Vaughan Williams Society, believes that these initials may conceal the identity of Sir William Henry Hadow (1859-1937), who was a friend of VW from around 1904. Whoever made the arrangement for strings knew what he (or she) was doing. The words are set to a pleasing and very sing-able melody, although it’s not as distinctive as the melodic material of Toward the Unknown Region. The piece is quite tranquil until VW gets to Whitman’s closing lines (‘Then we burst forth’) at which point, fittingly, the music becomes stronger in tone. It’s interesting to hear this small piece. I think, however, that there might have been a case for placing it first on the disc. Hyperion add approximately 17 seconds after the last, virtually inaudible chord of Sea Symphony has sounded but, in truth, one doesn’t want the risk of hearing any more music after that hushed close. This recording of Sea Symphony was made under studio conditions in the immediate aftermath of a concert performance by the same forces at London’s Barbican Hall on 13 October 2017; that was reviewed for Seen and Heard by Colin Clarke. Brabbins’ recording has a lot going for it but, I’m afraid, one conspicuous weakness too. One great strength of the performance is the contribution of the BBC Symphony Chorus. They sing with great commitment and as I followed in my vocal score I noted how observant they are of points of detail. Clearly, they have been scrupulously prepared by their chorus Director, Neil Ferris. They shine in the third movement, ‘The waves’, where their alert and agile singing enables them to enunciate both the words and the rhythms with admirable clarity. The BBC Symphony Orchestra matches them in their delivery of the incident-packed orchestration and, with Brabbins ensuring that the music has great vitality, this is a terrific account of the movement. Indeed, throughout the whole symphony I was greatly taken with the quality of both the choral singing and the orchestral playing. I mentioned earlier that Toward the Unknown Region was something of a pathfinder work for Sea Symphony. So it is, but even so the symphony represents a huge step forward in terms of the colourful, resourceful orchestration and also in terms of the ambition and effectiveness of the choral writing. So, you need an expert choir and orchestra to pull off this mighty work and that’s what we have here. You also need a conductor who has a real feel for the drama and sweep of the music and Martyn Brabbins fits that bill admirably. In less than expert hands Sea Symphony can appear to be a sprawling edifice but there’s never any danger of that here: Brabbins’ direction is taut and incisive but he also knows exactly when to be expansive – and to what degree. You also need two excellent soloists if Sea Symphony is to reach its maximum potential and that, I’m afraid, is where this performance is somewhat compromised. I’ve heard Marcus Farnsworth several times, both live and on disc, and I’ve admired what I’ve heard. He’s a sensitive and thoroughly musical singer, but here he seems out of sorts. His singing is clear of tone and diction but to my ears he sounds rather monochrome. Furthermore, his voice often lacks sufficient amplitude, as, for instance, in the first movement at the words ‘Fitful like a surge’ and, crucially, at ‘Indomitable, untamed as thee.’ These, unfortunately, are not isolated instances. The baritone is the leading protagonist in the second movement, ‘On the beach at night alone’. Here, VW doesn’t make things easy for his soloist because his opening phrases are based around single, repeated notes. Therefore, it’s crucial for the singer to use colour and to invest the words with meaning – without exaggeration, of course, I’m afraid Farnsworth’s delivery is just too straight. He fails to hold my interest and here, as elsewhere in the symphony, I don’t feel he commands the stage. Other singers have brought so much more to this movement and to the work as a whole, John Carol Cases’s very forwardly-produced tone isn’t usually to my taste but on Sir Adrian Boult’s 1968 recording he far out-sings Farnsworth. John Shirley-Quirk is even more compelling on André Previn’s 1970 version. Best of all is Roderick Williams on the 2014 live recording conducted by Sir Mark Elder (review). In the second movement and, indeed, throughout the symphony, Williams sings superbly and, without any unwarranted exaggeration, brings the words vividly to life. Other listeners may hear Marcus Farnsworth’s performance differently and respond to it more positively. I hope they do, but I had expected more from this gifted singer. Martyn Brabbins’ soprano is Elizabeth Llewellyn. I don’t believe I’ve heard her before but, my goodness, I’m glad that I have now. She, too, faces some stiff competition on disc: both Heather Harper and Sheila Armstrong make superb contributions to the Previn and Boult recordings respectively. As I indicated in my review of the Elder recording, I’m far less taken with his soprano, Katherine Broderick who, for me, sings with far too much vibrato. Elizabeth Llewellyn certainly doesn’t fall into that trap; though her voice is full, warm and generously-toned, she brings exemplary clarity both to the notes and to the words. Her first entry, ‘Flaunt out O sea your separate flags of nations’ grabs the listeners attention: you sense you’re in for a special performance. Later in the same movement she hits ‘Token of all brave captains’ like a laser and then she is imperious at the great climax on ‘One flag above all the rest’. She’s no less impressive in the finale, investing passages such as ‘O we can wait no longer’ with rapture. In this movement I also loved her subtle quiet singing. The vast finale sums up everything that is good about this performance. Nothing in VW’s output up to this point quite prepares you for the range and ambition of this movement. This is visionary music that finds the composer responding with great eloquence and invention to the lofty sentiments of Whitman’s verse. Martyn Brabbins really has the measure of this movement and he gets a wonderful response from his performers. The choir and orchestra build the extended opening section superbly and here, too, the Hyperion engineering team particularly deliver the goods: two details that caught my ear were the firm bass, reinforced by the organ, in quiet passages such as the opening and, secondly, the way the soft percussion comes through tellingly during the hushed closing pages. I found Brabbins’ account of ‘The explorers’ very compelling. Apart from my reservation concerning the baritone soloist, this is an estimable account of A Sea Symphony. The performance has been recorded very successfully by engineer Simon Eadon and producer Andrew Keener. As usual, Robert Matthew-Walker contributes notes that are well worth reading. 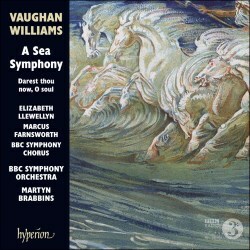 I wonder if Hyperion plan any more Vaughan Williams releases with Martyn Brabbins. It would be particularly welcome if he could couple Sancta Civitas, of which a new recording is seriously overdue, with the uniquely powerful Dona nobis pacem.